The tweet, written by Vox's Executive Editor Matt Yglesias, read, "Tinder will now be the ultimate sext machine," and included a link to a Vox piece about how the dating app's new features enable users to share pictures to their matches that disappear after 24 hours. Asked by BuzzFeed why he favorite the recent tweet, Weiner said it was an accident. "There were a bunch of favorites there that I either didn't recognize or mean to favorite," Weiner said. "I'm not clear on how they got marked in the first place but I assume hit the little star thing accidentally as I scrolled through stuff." Shortly after the article published, Weiner took to Twitter to make an apparent joke about the whole situation saying, "In related news, I did buy 1000 shares of Tinder stock." He later apologized for "favoriting" the message by tweeting, "Ok, to recap my day. I accidentally hit the star thingy on a @voxdotcom story about Tinder. Sorry." Weiner did not answer CNN's request for comment. Weiner gained national attention in 2011 when he resigned after admitting to sending inappropriate pictures and messages to several women. 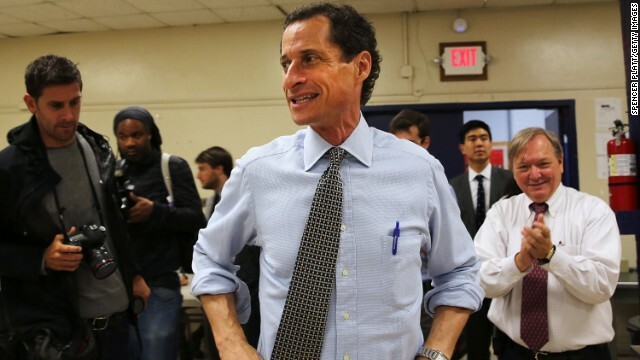 In 2013 Weiner again made headlines when lewd text messages surfaced between him and a 22-year-old woman while he was running for mayor of New York City. He just can't help himself!!! Hasn't his "sale by" date passed? This is what happens when you accidentally place the iPhone in your underwear with the camera on . I think this guy is sick. Can he just do away with social media. anthony weiner... poster child of the corrupt, pervert democrat party of criminals and con men. keep up the good work weiner!